The personal website of Tahni Candelaria, anthropology student and artist. Texts like this my father are by now commonplace. Whether he expresses concern about the prospect of Belgium being overrun by Islam, indignation about America being duped by Trump’s egomania (he voted for Gary Johnson), or disappointment at my choice to leave behind my successful business in pursuit of an anthropology degree, it is often in my direction that he chooses to air his grievances. To this particular text I responded with something like: “in France, there is no way it will go as you imagine that it should,” and left it at that. In fact, I usually respond in this manner, mostly to save myself from aggravating circular conversations. However, this text is one that merits a coherent and thoughtful response, if for none other reason than the pervasiveness of comments like this in the United States. The perceived failure of France, and Europe more generally, to be as “productive” as the United States is representative of what I have heard Americans say time and again (with an exception made for “the Germans” because, you know, they are so efficient and hardworking and all). I take my father’s text message as my first “case study,” hoping to shed light upon the numerous problematic assumptions it contains, and illustrating the dominant role The Economy plays in our everyday lives. Our culture in France is very linked [to our limited working hours], this 35 hours is strong in our history. Our generation wants more work life balance, a lot of workers want to work less and have a more balance with their life. This law is not following what the generation is expecting and in France there are a lot of discussions because it’s part of our culture. It would take a long time to change in companies, the workers won’t follow this at the beginning. To an extent I think it’s a good idea. For departments working the weekend it is good for the economy and for workers that don’t have enough money. But for the rest, more hours, people will adapt their contract because they won’t want to work more. Good on paper but I don’t see how people will follow them. Especially in France. 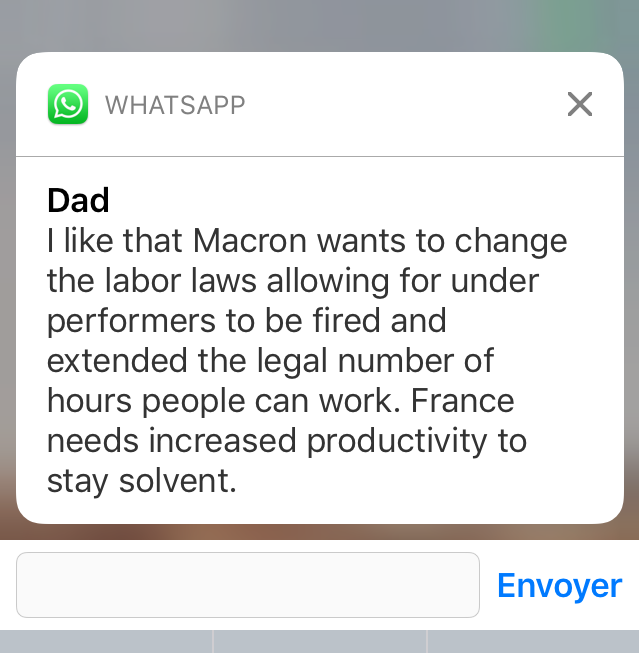 Ethan, another colleague who works as an interpreter in the European Commission commented that he read some studies about workers in Germany and France being far more productive in the hours they work during the day than Americans are in that same number of hours. The point is not whether or not this study is accurate, or precisely how it measures productivity. The point is that Ethan and Cléo both take issue with working hours being increased— neither believe that it will change anything nor that anything needs to be changed at all. Cléo’s comments are remarkable because she connects work to French culture, and more accurately, people’s expectations about what it means to work and what role work has in people’s everyday lives. In appealing to culture, Cléo is saying something about how this issue is deeper than economic incentives or earning money, it is a question of cosmology (defined as a “set of knowledge, beliefs, interpretations and practices of a society or culture related to explanations about the origins and evolution of the universe as well as the role and the meaning of humans, life, and the world, within the universe or cosmos”).3 The significance of workers’ views on the matter are amplified once something as powerful as cosmology enters the picture. Drawing from her own (French) understanding about the role and meaning of work, Cléo concludes that the proposed laws will not only just be “papers” in the end, but that people will actively find ways around it, because they don’t want to work more hours. This highlights the need for a greater understanding of workers on the ground— their desires, their practices, their needs, and their beliefs. Sociologist Randy Hodson, taking 84 ethnographies of the workplace, draws a number of insights about workplace life that underscore my point.4 Hodson examined workers resistance and in doing so, found that formal rules cannot fully control nor predict practices in the workplace. There were many other factors that required consideration, one of the most important being the atmosphere in the workplace. If managers garnered respect from the workers, resistance would be much lower, as is the case also in workplaces with higher turnover. Ultimately, for Hodson, resistance in the workplace is about workers’ sense of dignity. Making reference to Hodson’s work is not to say that in France, productivity can be increased if we focus on increasing a sense of dignity in the workplace. Instead, it demonstrates that formalized rules (or laws even) do not have the power to stipulate the terms of the workplace as intended. Furthermore, without a more careful examination of the environment and an understanding of how workers experience their employment, implementing updated labor laws will likely be on paper only. I hope it is clear by now that my skepticism emerges from a critique of any law that aims to alter the lives of people without considering those people themselves. If we are to take Cléo’s comments seriously, they suggest that the proposed changes would not increase productivity, but could lead to greater employee dissatisfaction. Cléo does not speak for the entirety of France, but her concerns call attention to the need for a closer look. In any case, it would behoove Mr. Macron to invest in social scientists who have the capability and commitment to understanding the contexts that shape workers’ understandings, expectations, realities, and actions. Decisions made and laws changed based on economic models will never be able to account for a variable such as the sense of dignity as felt in the work environment.